What is Deleting this Registry Key? Discussion in 'other software & services' started by Krusty, Mar 8, 2018. CCleaner > Cleaner > Applications > RegEdit? Something else in CCleaner? I really need to figure out what is deleting it. 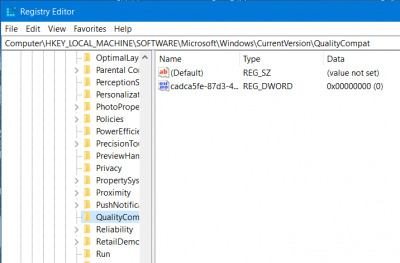 Do you run the Registry Cleaner Module in CCleaner? You are not using PrivaZer are you? Krusty I have CCleaner > Cleaner > Applications > Windows > RegEdit ticked and the key is not removed here. It does sound like a cleaner issue though, you may have ticked some other non-default option. Do you run the Registry Cleaner Module in CCleaner? You are not using PrivaZer are you? I do use PrivaZer but I have the Registry cleaning disabled. The problem is though that key is being deleted without running PrivaZer so I can rule that out. Paul, which Windows Explorer options have you enabled? I could be wrong but I would have thought any of those programs would stop the creation at worst, not delete it. I would not rule PrivaZer completely out. Maybe there is something hidden in the settings you are not seeing, or maybe PrivaZer has something that runs you are not aware of. I would give it an extra look over. Also check to see if PrivaZer has some sort of maintenance process that runs when you are not using it manually. Just the defaults (I think): MS Management Console, MS Search, RegEdit. CCEnhancer adds many options under Windows, but I have not selected any of them. But PrivaZer doesn't do anything until I run it. There is no background cleanup in the free version. I don't have 'Recent Documents' ticked. Does that key belong to Blackfog Privacy? No that is the key we need from M$ to receive updates. You can right-click on blue Windows Explorer in the CCleaner list and select restore default state. Thanks stapp. That's a neat trick I didn't know about. I just ran WD Update and received new definitions, then restarted and sure enough the key was recreated. I've run CCleaner in almost default state and the key is still there, so I'll have to see what happens from there. That sounds like a plan. I'll have to look into that as I've never used Process Monitor. If CCleaner isn't the cause how would I reproduce though? That would probably do the trick but creating custom rules is over my pay grade. I had just seen that post. Thanks @mood . Nearly midnight here so I'm to bed. I might investigate this program further tomorrow. The reg key value referenced is used by AV vendors to certify that their software is compatible with recent changes MS made for the Spectre motigation. If the key value does not exist, Win Update processing will not serve up OS and Microsoft app updates; either automatically or manually. This reg key value is normally set by AV software vendors but at least in the past could be manually created. My current understanding is if Windows Defender is the active realtime AV, this key is not necessary; Win Updating will be performed unimpeded. So if Windows Defender is your active AV solution and you are able to receive Win Updates, I would not be concerned about the key not being present. I'm on a machine running WD now. The key was present yesterday but it isn't today. My current understanding is if Windows Defender is the active realtime AV, this key is not necessary; Win Updating will be performed unimpeded. So if Windows Defender is your active AV solution and you are able to receive Win Updates, I would not be concerned about the key not being present. That sounds good but WD (or maybe Malwarebytes?) appears to create it and something is removing it.